A new nature of small three-door hatch is rolling off the vehicle rigs across Australia. Low emissions, high fuel efficiency, fun and with plenty of style, the brand new Renault Clio GT is fun for those on the lookout for a car that will brighten up your day and put a smile on your face. 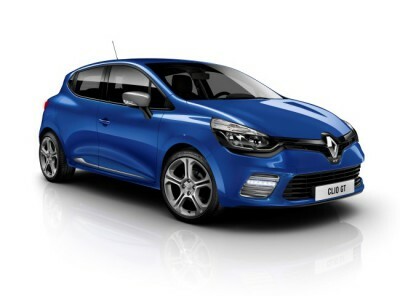 Men and women alike will love the little Renault’s style. Classy, cheeky looks do look way more expensive than the amount of money you will have to part with in order to own a new Clio GT. With a pair of long legs, fuel efficiency is superb in the city and in the country. Find an open piece of road, and the Renault Clio GT loves to purr along at the speed limit sipping delicately on the fuel from the 45-litre fuel tank. It’s a mighty nice way to travel frugally, and the 1.2-litre turbocharged engine has a perky side to its power delivery – 0-100 km/h is completed in less than 10 seconds. Not only is the little Clio GT fun to drive, the ride quality is up with the best in its class. The Pseudo MacPherson struts for the front suspension and the torsion beam axle at the rear are set for a nice blend of tautness for road holding and softness for ride comfort. Comfortable seats, good leg room in the back, and you’ve got a great reason to downsize to the small new Renault Clio GT. Finding your park space and setting about parking in busy, congested streets is so easy in the smallest Renault Hatch. Boasting a turning circle of 10.6 m and an effortless electronically aided steering system, flicking in and out of tight spots is a piece of cake. Being a well-equipped car, there are parking aids available which further make the process of bagging the best park quick and easy. Interior cabin space is very good, and the handy 300 litres of luggage space with the rear seats up allows you to carry plenty of shopping items. If more space is needed, 1146 litres is available with the rear seats down flat – and you can utilise the 60:40 split in the rear seats for putting awkward shaped cargo into the Clio GT while still having a seat or two available for rear seat occupants. 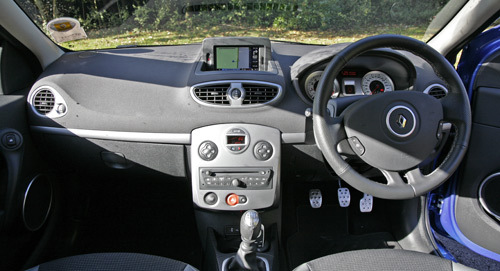 Sitting inside the new Renault Clio is comfortable, and there are an array of technological features and luxury items. In the centre of the dash is an intuitive media console that displays itself via a clear 7-inch touchscreen. You can direct your journey with the navigation system, and Bluetooth hands-free technology is excellent for keeping your eyes on the road while keeping your chin wagging. Steering wheel controls direct the splendid sound system, while cruise control keeps you travelling legally out on the open road. I like the dash layout; it looks pleasant and is easy to use. Perhaps, if I do have a small gripe, it would be that the slightly less flattering plastics that Renault has used for the dash fascia look a little too cheap. That aside, the Renault Clio GT cabin is a nice place to lodge in. Safety is first class – as we’ve come to expect from Renault. Renault cars are some of the safest cars on the road, so if you’re looking to downsize but keep the best safety possible in a small hatchback design, the Renault Clio GT is a very good choice with its sound five-star safety credibility. The Renault Clio was awarded Euro NCAP’s ‘Best Car of 2012’ in the ‘Super-mini’ class, while also earning the highest 5-star safety rating in the process. Now that’s some great news. ABS, EBA, EBD, ESC, Anti-Slip Regulation (ASR), Hill Start Assist (HSA), rear parking sensors, a rear view camera (GT Premium), 3 three-point rear seatbelts, two rear seats with ISOFIX 3-point attachment system and the full array of front and side airbags are all standard safety features. What sets the Clio GT and GT Premium apart from other Clio models are features like the paddle shifters on the steering wheel, the R.S. Drive that offer two driving modes – Normal or Sport, the GT Chassis, 4-speaker Arkamys sound with 2 extra tweeters, voice recognition software, heated front seats (Clio GT Premium), GT upholstery in dark carbon cloth, and the GT logo on the front headrests. Renault’s Clio GT Premium gets the full GT upholstery in dark carbon leather with the GT logo on the front headrests. Both models offer satin grey interior trim, body coloured side bumpers with a satin grey strip, gloss black trim on the radiator grille and 17-inch Anthracite alloy wheels. The Clio GT premium also gets a large panoramic sunroof. Hot looks for a hot price! All this brand new for under $30 k, and Renault’s excellent five year/unlimited km warranty with 24 hour roadside assistance is an additional cost-free feature. As a small hatch, the Renault Clio GT is great little performer. For any more information on the new Renault Clio GT, or for that matter any other new car, contact one of our friendly consultants on 1300 303 181. If you’d like some fleet discount pricing (yes even for private buyers! ), we can submit vehicle quotes requests out to our national network of Renault dealers and come back with pricing within 24 hours. Private Fleet – car buying made easy!